“Dallas Buyers Club” has all the characteristics of an “Award Movie”: sick people, homophobia, a star in the main role who went through a stunning physical transformation for this role, and last but not least the “Erin Brokovich” factor of the little guy standing up against industry and government’s collusion and immorality. The good thing is that despite checking all those boxes, this film does not feel heavy handed. It is a film about the age of AIDS and how it affected people, but what’s more important is that it is about one guy who decided that he will do whatever necessary to not die, and then widens his perspective – not towards becoming a modern Robin Hood and helping all those poor sick people around him, but towards identifying a group of customers that has a high propensity to purchase a product he has identified. There is no need to love Ron Woodfroff, played by a Matthew McConaughey with angry intensity and no pathos whatsoever. He is sick, he will die of the sickness, but that does not mean that he suddenly would need to become a good or even nice person. He is a half-likable, half-disgusting hick at the beginning, and stays that way until the end of the film. The audience still roots for him, because by trying to save himself and make some money, he discovers an incredibly inhumane system of government approval for drugs, an industrial drug testing strategy that cares more for fast-tracking than for curing, and he discovers what it is like to be on the wrong side of the casual homophobia he has been sporting as part of his rodeo cool guy image himself. He fights against that system not because of the humanity in his core, because he is pissed off by them throwing stones in his way. 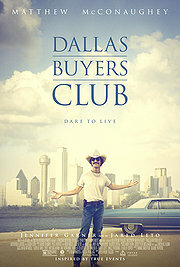 With a sensational cast of high and low profile side actors, from Jared Leto as as transgender Rayon, Jennifer Garner as Doctor Saks or also Michael O’Neill playing a partly disgruntled partly disheartened FDA agent, and my favourite Griffin Dunne as cool and shrewd Mexican-based doctor Vass, “Dallas Buyers Club” should be a justification for giving out cast or casting awards. Nice review Thomas, but I have to say there’s one bit i think you overlook about Ron. As his condition worsens and he spends more time (granted, reluctantly) around Rayon, I think he begins to soften a little in the center and begins to empathize with others more. He’s not quite as harsh and off-putting as he is first introduced, at least I didn’t think so. All the same, this was a great movie and had moving performances from all the cast. I loved it.